With a lot of Anchorage heading out of town last Friday for Independence Day weekend, art galleries were sort of divided about which First Friday to observe — July 1 or July 8. Among artists opting for the earlier date was Amy Johnson, who has taken the unusual step of opening a temporary gallery on Sixth Avenue to show her own work. Originally from North Carolina, Johnson studied art at the University of Colorado and University of Washington. She's been a resident at the elite Archie Bray Foundation for the Ceramic Arts in Helena, Montana, the Vermont Studio Center and worked in Finland and Japan. She came to Alaska in 2011, she said, "to see what I could do." 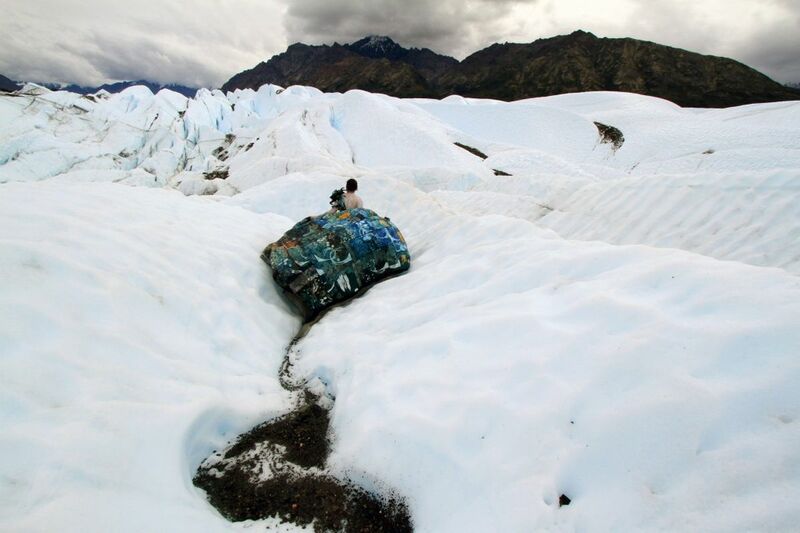 Since then her work has been seen in various venues around Anchorage, notably a series of photographs titled "The Matanuska Project" in which she brought an extravagant blue evening gown for photos on the Matanuska Glacier. But the current show, "TILT," contains much more than photos. It includes work done over the past few years in watercolor, ceramics, fabric art and video, one of which is projected in a mini movie theater built for the exhibit. Remarkably, the spaciously exhibited pieces in different media all connect. "TILT" is simultaneously one of the most diversified and yet unified solo shows I've seen, which is part of Johnson's holistic approach. "I wanted a place to show all this work together," she said. "And I wanted to do it on my own to see how it's going to go." That doing it on her own thing is as much a part of the show as the art itself. "I had to find the space and rent it for four months, paint everything, build a projection room," she said. And figure out how to deal with such less-than-aesthetic details as publicity and insurance. "This is my first kind of entrepreneurial endeavor," she said. "The Matanuska Project" photos are displayed on one wall opposite a series of recent watercolor and ink drawings titled "Melt." "I'd never worked with watercolors before," she said, "but I had them, so I tried using them. I made a little painting in March and got obsessed. I must have made hundreds of them over the course of three months." In a second room is a screen showing a short video made in Finland, "Tempted Still," a sort of mythological mediation on fall and nature. A second video, "The Space Between," shows in the little sit-down "theater" she built for the exhibit. It has two 8-by-16-foot screens set at an angle, often used to show mirror images. This video was made in the Chugach while snow was on the ground. "We started hiking up to Rabbit Lake and the weather was clear," Johnson recalled. "Then the wind came up, like 60 miles an hour. Which made it a little more difficult, but a lot more interesting." The feathered dress and jacket Johnson wears in "The Space Between" are mounted as part of the show, as is the psychedelic evening gown worn for "The Matanuska Project." The exhibit also includes sets of small ceramic dishes and spoons, T-shirts and postcard books featuring the "Melt" paintings. It took about six weeks to build the space for "TILT." (The name refers to the Earth's axis in regard to the sun.) The show had a "soft opening" on June 20 with about 100 people in attendance. It will remain up through the end of August when her four-month lease is up. The gallery is open noon-7 p.m. daily except Wednesdays at 320 W. Sixth Avenue, part of the Fifth Avenue Mall building on the opposite side of the street from Nordstrom. Johnson gives gallery talks every Saturday at 2 p.m., but will be happy to chat whenever someone finds their way through the doors. 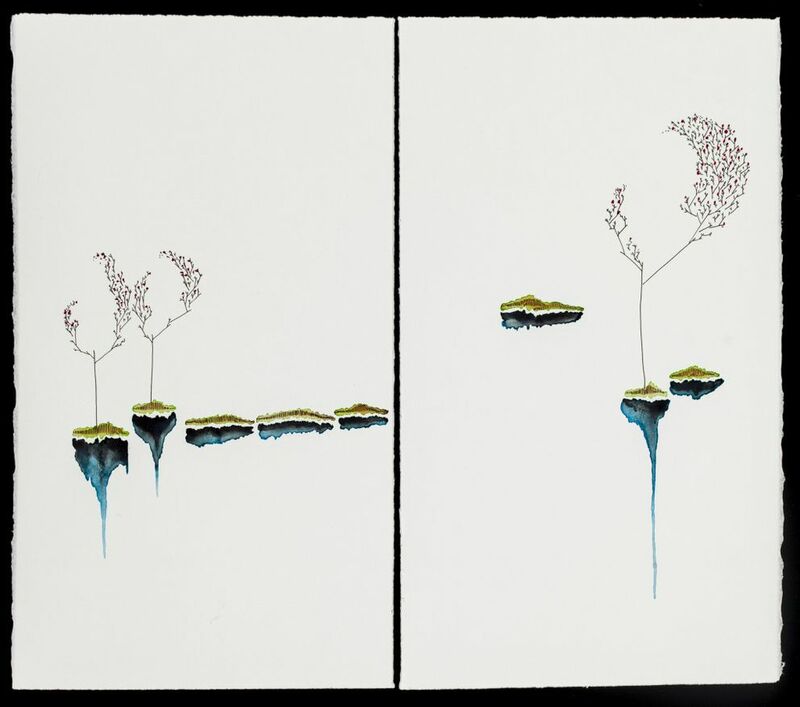 A closing reception is scheduled for 6 p.m. on Aug. 27. Correction: A previous version of this article gave the wrong state of Amy Johnson's birth. She is from North Carolina, not South Carolina.